A giant tree just fell in the forest and there is a reason why you might not have heard it. Though he played a key role in the creation of two iconic Minnesota parks and several key environmental institutions, Martin Kellogg never sought to be the center of attention. Instead, he was driven by an intense desire to protect Minnesota’s most special outdoor treasures by using his influence with key political, business and conservation leaders in ways that will benefit Minnesotans for generations to come. Kellogg died March 21 at the age of 88. “When you think about outdoor recreation, conservation and tourism in Minnesota you have to recognize Martin’s role in the development of all three,” said Brett Feldman, Parks & Trails Council of Minnesota executive director. 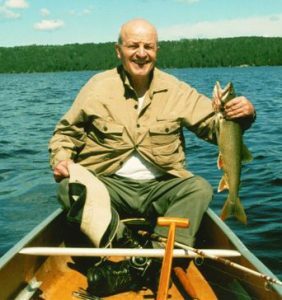 “All of us should give thanks that Martin loved rugged physical challenges as much as he loved Minnesota’s Great Outdoors because once you combine those qualities with his business smarts and political connections you end up with a relentless guy whose legacy was helping to make sure that Voyageurs National Park and Grand Portage State Park and numerous other special places exist today. At around the same time Kellogg was helping to lead the charge for Voyageurs, he got involved with other parkland preservation visionaries who were building the Parks & Trails Council of Minnesota (P&TC), an advocacy organization that exists to acquire, protect and enhance critical land for the public’s use and benefit. Remarkably, Kellogg stayed deeply involved with both VNPA and P&TC for a half century. A marine veteran with degrees in law, business administration and industrial engineering; and master’s degrees in accounting and economics, Kellogg worked for more than four decades as a business executive, retiring as President and CEO of United For Excellence (UFE) Inc, an international manufacturer of precision molded plastics. Kellogg sold UFE in 2008. Kellogg used his business experience to help build several nonprofit organizations for conservation and the environment. He understood that creating parks and wilderness areas alone didn’t guarantee they would be protected forever. He believed ongoing stewardship was a job for nonprofit groups with staff, volunteers and resources that could defend them at all costs. So even though he could count such dignitaries as Gov. 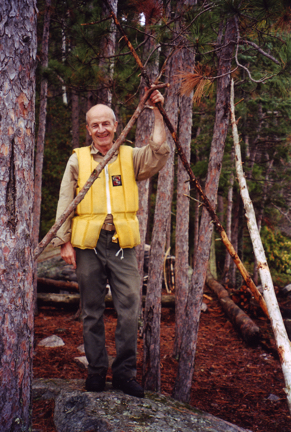 Elmer Anderson and American author and wilderness protection advocate Sigurd Olson among his friends, Kellogg was deeply committed to finding and nurturing the next generation of conservation leaders to continue work he was doing. He did this with numerous people and organizations. Nothing illustrates this more than the way he groomed the dynamic husband and wife team of Mark and Joan Strobel to lead parkland protection efforts on the North Shore. In addition to VNPA and P&TC, Kellogg also helped launch the Minnesota Environmental Fund, and he served on or chaired the boards of the Metropolitan Council, the Nature Conservancy, the Carpenter Nature Center, the St. Croix River Association, the Minnesota Landscape Arboretum and the James Ford Bell Library at the University of Minnesota. He received numerous awards for his conservation work, including P&TC’s prestigious Reuel Harmon Award and the Wilderness Society’s Environmental Hero Award. Kellogg is survived by wife Esther; children Joe (Joanne), Doug (Needhi), Bill (Jennifer) and Jeannine; and several grandchildren. A visitation will be held Thursday, April 11, from 5-7 PM at O’Halloran and Murphy, 575 Snelling Ave. South, St. Paul. A memorial service will be held Friday, April 12, at 11 AM at Hope Presbyterian Church, 7132 Portland Avenue in Richfield with a visitation 1 hour before the service.